Dateline, June 29, 2013: The first atheist monument to be displayed on U.S. government property will be dedicated today in Starke, Florida. 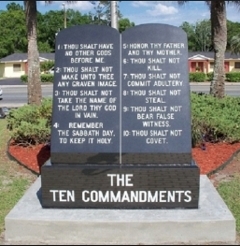 The monument is near a black granite display of the Ten Commandments, which was installed in the courtyard of the Bradford County Courthouse last year. To my mind, I see Atheists and the Theists (believers) as profoundly similar. Indeed, ‘This is called profound sameness.‘ Interestingly enough, this also parallels Shakespeare’s “Rose” dialogue. Yet another point where East meets West. I was looking up something related to the Upanishads, and stumbled onto Monism and subjects related. That got me wondering. Do ‘These two are the same coming out, yet differ in name’ and ‘This is called profound sameness‘ speak to the foundation of the Taoist point of view, or are these merely a syncretic gateway to that point of view? Monism is a point of view within metaphysics which argues that the variety of existing things in the universe are reducible to one substance or reality, and therefore that the fundamental character of the universe is unity. Contrasting with this point of view is dualism, which asserts that there are two ultimately irreconcilable substances or realities, with consciousness and/or mind on the one hand and matter on the other. Another is pluralism that asserts any number of fundamental substances or realities more than two. Monisms may be theologically syncretic by proposing there is one God who has many manifestations in the diverse religious traditions. Okay, but why do we need to restrict nature? To answer this, I must look to nature as experienced by all other animals on earth. Do they restrict nature? The answer becomes embarrassingly brain-dead simple: like all animals, we chose what we like, what pleases us; we reject that which displeases us. Pleasure and pain tip the scales for all living creatures, including humans. The reason this can be difficult to acknowledge is that we have an invested interest in NOT SEEING ‘the out there’ in as impartial a light as possible—just the contrary. We NEED to have our biases reinforced; we FEAR any countervailing evidence that might compromise our position. I have a hard time identifying the idea of an ego apart from a relationship to ‘otherness’. In a sense, ego is the counterpoint to other. The more connected my psyche has become to ‘otherness’, the less ego I seem to experience. I suppose the Hindu dictum Tat Tvam Asi (“You are that,” or “That you are,” ) sums it up. Still, that is a little highfaluting. I expect this is an oddly unresolvable issue. Fundamentally, I am probing the workings of the nervous system with my nervous system. This is why is helps to consider the simplest forms of life. Finding similarity between ants and humans, for example, theoretically helps me avoid some misdirection due to my complex nervous system. See also, Ants are Us and Self Integrity, Slime, and Karma.